At the crossroads of two major ancient roads, the north/south Via Maris and the east/west Acre-Tiberias road, was the once great city of Sepphoris. Known as Zippori in Hebrew, it was the capital city of Galilee throughout many periods. 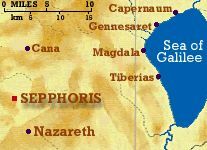 For a time, Herod Antipas made it his capital after inheriting the territory at his father's (Herod the Great) death in 4 B.C. As the city was greatly destroyed by the Romans after a riot in the city only a couple of years earlier, Herod Antipas began an ambitious and extensive building program. The demand for laborers would have been great. It is no stretch of the imagination to assume that Jesus and his father Joseph would have found work there. The first archaeological dig at Sepphoris was done in 1930 by a team from the University of Michigan under the direction of Leroy Waterman. After that, nothing was done until 1983, when James Strange from the University of South Florida resumed excavations at the site. Later, in 1985, a joint team from Duke University and Hebrew University under the direction of Eric Myers and Ehud Netzer, also began extensive work here. Continuous work has been done since then by these and other groups. Through the years, the size of the dig has expanded uncovering more and more of the city. Working with the University Of South Florida, under the direction of Dr. James Strange, the CenturyOne Foundation not only is seeking additonal funding to help see that this work continues, but we are looking for more volunteers to go to Sepphoris and help excavate the site this summer. If you are interested, please take a look at the information provided at the link below. ©2018 CenturyOne Foundation, Inc.– a Nonprofit Organization All Rights Reserved.All materials contained in the CenturyOne Foundation Web Site are protected by copyright and trademark laws and may not be used for any purpose whatsoever other than private, non-commercial viewing purposes. Derivative works and other unauthorized copying or use of stills, video footage, text or graphics is expressly prohibited.